So I asked on my facebook page which recipe I should blog about first and the resounding winner was for my gluten free chocolate cookies with peanut butter chips. I would love to say that I made this recipe from scratch, but alas, this is very much an existing recipe, which I converted to gluten free goodness. The original recipe is Reese's Chewy Chocolate Cookies, found on the back of a packet of Reese's Peanut Butter Chips. Having had a quick mooch around on the internet it turns out that Reese'e Peanut Butter Chips are indeed gluten free, yay! So I figured I would give it a go in making this recipe gluten free. More often than not, to make a gluten recipe gluten free, I end up having to tinker with the measurements of the flour, sugar and so forth and not able to do a direct conversion. These cookies happen to be an exception to the rule. The quantity of ingredients remains the same irregardless, which was a pleasant surprise when I decided to test these out. My real challenge was figuring out how to make chocolate cookies look attractive in pictures. I realised that you can't really, they still just end up looking like brown blobs. However, I can get over their unappetising aesthetics as they taste so delicious. So here it is - my gluten free chocolate cookie heaven, adapted from the Reese's Chewy Chocolate Cookies. They are so tasty, chewy and moreish. Easy to bake too. Please see my Cups For Cooking page for conversions, if needed. - Preheat the oven to 180 degrees C. I use a convection oven, so if you use a fan oven make sure to drop your temperature by 10 - 15 degrees to accommodate. Make sure the baking rack is in the centre of the oven. 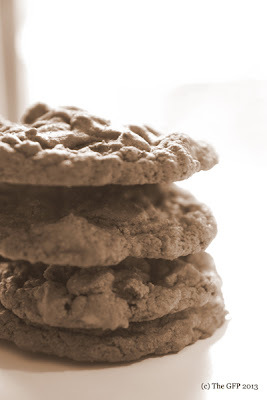 This recipe makes around 30 medium to large sized cookies. - In a medium sized bowl, combine the flour, cocoa, bicarbonate of soda and salt. - In a seperate large bowl - I use a kitchenaid for this, but a handheld electric beater will be just as effective, beat the butter until it is smooth and then add the caster sugar until the mix is fluffy. - Add the eggs and vanilla and beat well. - Gradually add the flour mixture, a bit at a time, beating well until fully combined. - Stir in the peanut butter chips or the chopped walnuts into the cookie dough. I find the peanut butter chips can tend to be rather too sweet with this recipe, so I actually prefer the chopped walnuts - though both are genuinely good. - Drop by roughly rounded, heaped teaspoons (a very generous amount per cookie), onto an ungreased baking sheet. When baking they spread fairly evenly, so make sure there is enough space between each cookie. - Bake for 9 minutes only. Do not over bake. Remove from the oven and let them sit on the baking sheet for at least 5-7 minutes before removing the cookies and placing them on a wire rack for cooling. These are great by themselves (with a glass of milk) and really excellent served as a vanilla ice cream sandwich! Enjoy!